As we’ve reported, the historic Sixth Street Bridge is about to be demolished to make way for a shiny new iteration. Work kicks into high gear tonight, with a stretch of the 101 near DTLA closed for 40 hours, beginning at 10 p.m. on Friday and ending mid-afternoon on Sunday—hopefully before the Super Bowl’s 3:30 p.m. kickoff. 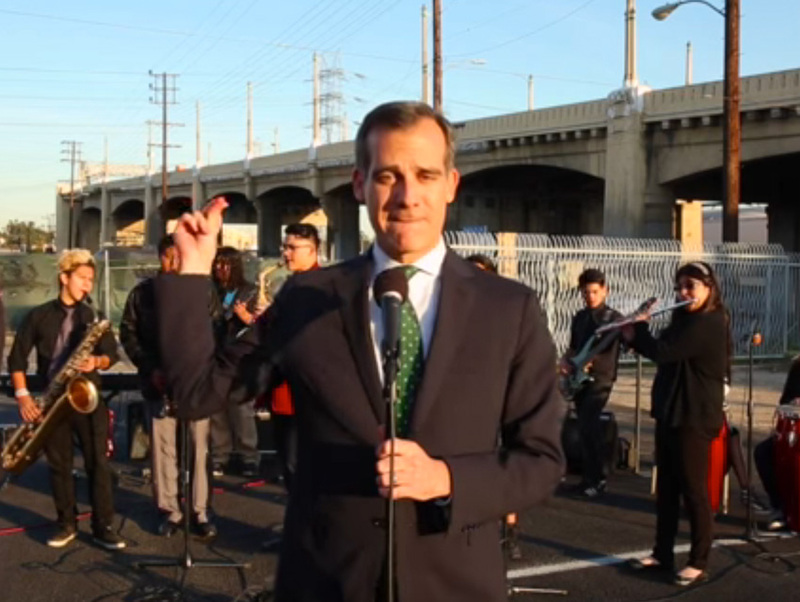 To warn drivers of the traffic impediment and highlight the detours, which encompass the 110 south and the 710 north, Mayor Garcetti joined forces with the Theodore Roosevelt High School Jazz Band, to perform #101SlowJam. The spoken-word chill-out features the mayor delivering lines in a way only he can—infused with a nerdy energy that you want to wrap yourself up with like a warm blanket. Take for instance this line, “So on Friday night… the 101 Freeway east of downtown will take a break for 40 hours of R&R… and R&B… Stay safe out there, cats.” Watch below and click here for more bridge and traffic info.